(NaturalNews) Just as Natural News has warned for over a decade, mind-altering medications such as tranquilizers and psychiatric drugs (SSRIs) have now been confirmed to increase the risk of a person committing murder. A new study published in the journal World Psychiatry (June 1 edition, not yet found on the web) found that several classes of prescription medications -- including antidepressant drugs, tranquilizers and anti-inflammatory painkillers -- markedly increased the chances of someone murdering another human being. This link has long been suspect in antidepressants, which have been repeatedly linked to mass school shootings in the United States. "I think that these chemical substances affect the impulse control of the person," Dr. Jari Tiihonen, lead author and a professor, told Medical Daily. "The only surprising result was that painkillers also increase the risk." • Antidepressant drugs increased the risk of committing homicide by 31%. • Tranquilizers increased the risk of committing homicide by 45%. • Opioid pain relievers increased the risk of committing homicide by 92%. • Anti-inflammatory painkillers increased the risk of committing homicide by 200%. For years, the New Media / Independent Media has been warning about the dangers of psychiatric drugs causing violence. The mainstream media, which now receives as much as 70% of its advertising revenue from drug companies, has all but censored this story, largely ignoring the mass deaths taking place right in our local communities. Since then, Natural News and other media sources have continued to cover the link between psychiatric drugs and violence, including this story: Prescription drugs are connected to school shootings and other violence, yet more drugs are touted as the solution. Is Big Pharma contributing to the wave of homicidal violence sweeping America? America is presently experiencing a massive crime wave, with gangs running loose in the streets of cities like Baltimore and Chicago. The number of shootings that took place in Baltimore over just the Memorial Day weekend -- 32 -- is larger than the total number of shootings that take place in an entire year in many other countries. In the month of May alone, there were 300 shootings in Chicago, with 35 deaths. Gun control advocates point to firearms as the cause of such violence, but the logic doesn't pan out. Guns don't shoot by themselves. (I tried it with a magic wand over and over, and I could never get my rifle to fire unless I deliberately pulled the trigger.) Firearms require a person to make a decision in order to unleash a high-velocity bullet in the direction of an intended target. That decision-making process is precisely what's compromised by mind-altering medications. SSRIs can push some people over the edge, causing them to illegally use a firearm in a way its manufacturer never intended. In much the same way, someone can drink a lot of alcohol and use a vehicle to commit mass homicide, too. Both of these are chemically induced homicides using mechanical tools (cars or guns) which were never meant to kill innocent people. What they both have in common is inhibited cognitive function caused by chemicals. "Medicated driving" is just as dangerous as "drunk driving..." and possibly even more so. The mainstream media is predictably trying to downplay the increased risk homicidal behavior among people medicated with antidepressants, claiming a 31% increased risk is only a "slight" risk. Of course, this is the same media that, if presented with a press release from the CDC claiming unvaccinated children had a 31% increased risk of contracting measles in Disneyland, would be screaming bloody murder and causing a nationwide infectious disease panic. "Thirty-one percent increased risk!! Get your damn kids vaccinated!" Example of the total dismissal of the risk factors documented in the study: "When asked about the practical implications of these findings, Tiihonen said that people should not be worried about the risk of violence associated with antidepressant use," reports LiveScience.com, which also downplays any link between antidepressant drugs and violence. Why, exactly, should we not be worried about medicated people committing mass murder? Maybe because that worry would call into question all the lies we've been told about drug safety by the FDA and Big Pharma. Even if the increased risk seems small on an individual basis, you have tens of millions of Americans taking these drugs. A small risk multiplied by tens of millions of people results in the inevitability of a drug-induced homicide or mass murder... much like what we saw in Columbine, Colorado, and other school shootings. 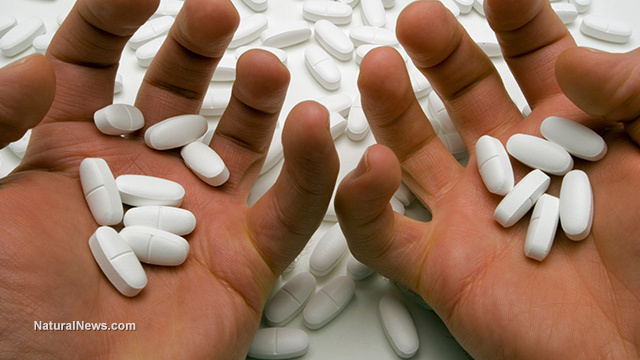 According to CDC statistics, almost 30 million Americans aged 12 and over are now taking antidepressant medications. That's 30 million would-be killers... ticking time bombs of violence if the drugs trigger homicidal violence in their brains. There are almost a hundred million more people who take anti-inflammatory painkillers, too, according to this Consumer Reports document. On top of that, there are presently about 60 million prescriptions written each year for tranquilizer-class medications. Clearly, we're talking about more than one-third of Americans taking these risky medications that can cause homicidal behavior. That's not a small deal by any measure. • There is virtually zero risk of being harmed or attacked by a terrorist anywhere in the United States. Yet the entire Patriot Act surveillance state / TSA / police state / militarized police infrastructure that has been put into place since 2001 was based on the heavily marketed fear that terrorists were hiding around every corner, waiting to kill us all. In truth, almost no one in America has even seen a terrorist, much less been killed by one. • There is almost ZERO risk that a healthy, unvaccinated child exposed to measles will be killed by measles. Even in the heavily propagandized Disneyland outbreak, not a single child died. Some got the measles, built their own immune system antibodies, and recovered naturally. • Almost no one dies from raw milk consumption in America, yet the FDA and state "food Nazi" thugs wage surveillance wars and arrest people like James Stewart at gunpoint (SWAT style) for distributing raw milk to health-conscious parents who desire the wholesome beverage. The most important take away message from all this is to get off the mind-altering meds. If you're taking psychiatric drugs or tranquilizers, you run the risk of "snapping" and turning into a homicidal maniac who kills other people. That's precisely what this study documented. It also calls into question the escalating violence in a country that's the most medicated nation in the world: America. When you combine the scourge of mind-altering medications with the cognitive-harming effects of fluoride, glyphosate, pesticides and urban air pollution, is it any wonder things keep getting worse among the voters? Study: Tiihonen J, Lehti M, Aaltonen M, Kivivuori J, Kautiainen H, Virta L, Hoti F, Tanskanen A, Korhonen P. Psychotropic drugs and homicide: a prospective cohort study from Finland. World Psychiatry. 2015.